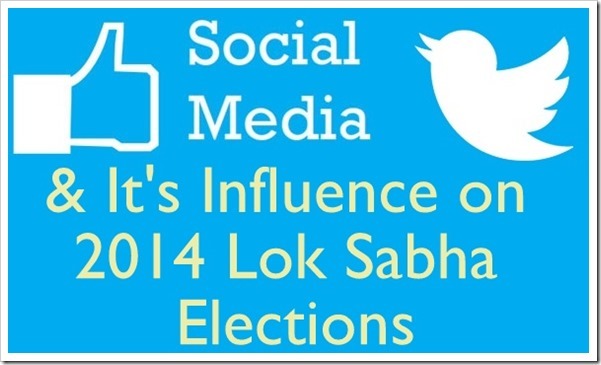 Can Social Media Influence 2014 Lok Sabha Election in India? Answer is YES! In a recent study conducted by The Internet and Mobile Association of India [IAMAI], it was found that India’s dynamic Internet population can swing around 3-4% of votes in the next Lok Sabha elections in India. 3-4% of votes mean a lot in a closely fought election and when the stakes are high; this can be a major factor in determining which party wins majority and can have huge implications on the political landscape. Infact, even one percent of vote shift can sometimes mean difference between winning and losing! Out of 140 million Internet users in India, 86 million are active on Social Networks such as Facebook, Twitter, LinkedIn and Orkut. And this figure is expected to reach 91 million by the end of the year, with 19% growth rate. The survey also found one interesting fact: the major user base of social media in urban locations are young men and college going students between the age group 18-24 and working women who are increasingly tilting towards social media usage. Political parties are aware of this fact, and this is the reason both Congress and BJP have set up their exclusive social media teams which have enormous budget allocation to influence netizens. On one hand, there is BJP led by Narendra Modi who has asked his social media team to get 48 lakh IDs of social media users and is aggressively pushing his agenda via Twitter, Google Hangouts and Facebook. BJP has already roped in veteran Internet strategists and Entrepreneurs Rajesh Jain and BG Mahesh who have in the past created some of the biggest online ventures in India. On the other hand, Congress has also pulled its socks and is all set to unleash their own social media plans to influence online population. Reportedly, Congress party has set up Rs 100 crore war chest to counter BJP’s social media plans and aggressively promote themselves on social media across all platforms. In fact, social media has become so mainstream in politics that India’s oldest political party had to openly declare its social media campaign in order to send a message across. Then there are guerilla social media marketing adapted by Arvind Kejriwal’s AAP; wherein they are using short, sharp strategies to inflict maximum damage to the bigger political parties. For example, it was observed that AAP’s social media team has bought all keywords related with Narendra Modi on Google search results and Google display advertisement partners. Hence, when anyone searches “Narendra Modi”, AAP’s banners and posters are visible. Besides this, they are also pretty much active on Facebook and Twitter as well, garnering millions of likes and comments. It would be really interesting to see, how much influence social media has on the results of general elections next year. Going by the trends till now, it seems none of the political parties will take any chance to miss the boat. Indian Social media users: Brace for more politics! Snapdeal Partners With ReGlobe To Buy Used Mobile Handsets! Google Brings Chromebooks To India With Broadband Bundles. Will You Go For It?